Yesterday NetEnt released a video on YouTube showing the gameplay for the upcoming slot Aliens. Aliens is about to go live on April 24th. It is another branded slot game after a couple of very popular once in the past like Creature from the Black Lagoon and Frankenstein. 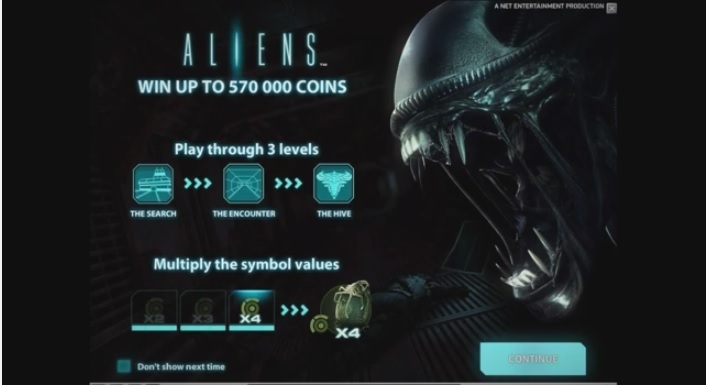 Aliens comes with 15 paylines, wild symbols and a 3-level bonus game. I have to be honest, the video is kind of confusing to me, so don’t know exactly how the bonus game works yet. But what NetEnt tells me is that there are 3 bonus levels. In the first level you collect the highest possible multiplier for the second level. In the second level you get guaranteed wins on every free spin and in the third level you have to try to destroy the hyve. All sound pretty cool. When the game goes live, or more information becomes available I will inform you with more information. Another free spins challenge at ComeOn!